Malaysia is an incredibly diverse nation and a traveller’s delight! But you know what’s the best thing about Malaysia? They welcome travellers from India by offering Malaysian Travel Visa online for free (eNTRI Visa)! In this post, we are going to tell you how to apply Malaysia eNTRI Visa online from India in 6 simple steps! You just need to pay a processing fee of USD 20 and no charges for the visa itself. Also, do you know how long it takes to get Malaysian Visa online? It’s issued within 48 hours max! The Malaysian government has introduced these visa friendly moves to help Indian travellers and boost tourism in their country. eNTRI – Electronic Travel Registration & Information (eNTRI). 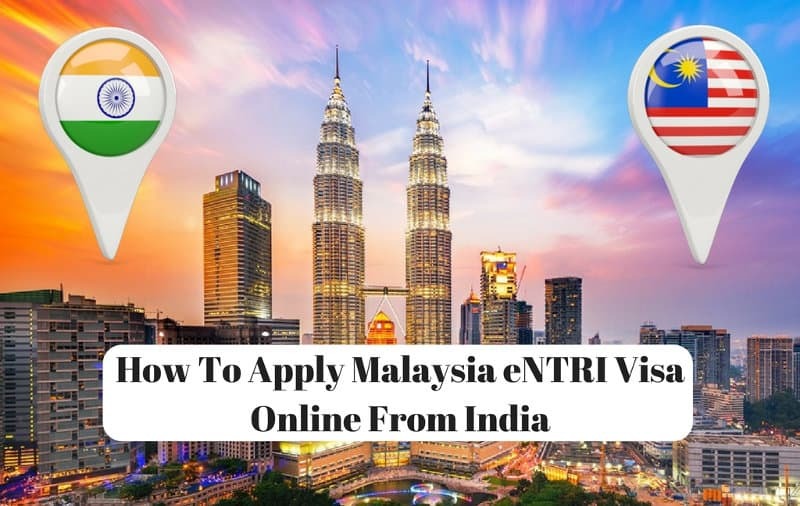 For those who apply malaysia eNTRI Visa online, It is the easiest and best visa option for Indian citizens going to Malaysia for a short travel. The Visa allows you to travel in Malaysia for 15 days. eNTRI Visa can be obtained in as little time as 48 hours after applying! The visa is valid for 3 months from the date of issue. In fact, it can be even extended for 15 days. However, it’s a single entry visa. Once you use it, it can’t be used again. After applying, an eNTRI Note will be issued as proof of registration and you’d have to present the note upon arrival in Malaysia. As we mentioned earlier the eNTRI Visa been made free for Indians (No visa fee, only processing fee). This Visa Fee Waiver Scheme will last until 31st March 2018. How To Apply Malaysia Visa Online From India? Step 2: Create an account by clicking on “I’m New”. Here you’d have to enter your details such as name, email, passport number, address and choose a password for your account. Ensure that your photo has a white background so that it doesn’t get rejected by a system error. Also, if you are planning on staying with your friend or relative in Malaysia, then you can do either of these two things to submit proof of accommodation. Create a cover letter in PDF addressed “To The Immigration Officer” stating your name, passport and address you are going to stay in Malaysia. With this cover letter also include your friend’s or relative’s details (Identification Card – Passport, Malaysia Work Visa etc). Upload all this together as proof of accommodation document. Otherwise, the more simple and efficient option is to book a hotel stay online in Malaysia and print the Hotel Accommodation copy to be submitted as proof of accommodation when applying for eNTRI Visa. These details will include the date of passport issuance and it’s expiry. Give the details regarding your local address and also the Malaysian address where you are planning to stay. Simply make sure your photo is as per the specification in the editor. If not you can crop the photo to make it fit the required dimension. Also, ensure white background of the photo. You can make payment via either VISA card or MasterCard. Since Visa Fees are waived you’d only have to pay a processing fee of USD 20. That’s about it! Complete the payment and apply Malaysia eNTRI Visa online! The eNTRI Note is generated on the spot. Also, print the v2 and v3 versions of the eNTRI note as suggested on the website. So these are the 6 simple steps to follow to apply for Malaysia eNTRI Visa online. Share this article with your friends and relatives planning a trip to Malaysia! For any further clarifications please comment below. « 10 Amazing Things To Do In New York Absolutely Free!